Road Ready: This converted UPS truck features a 32-kilowatt fuel-cell module from Hydrogenics. Austin Mabrey steers the clanging United Parcel Service (UPS) van down a street in Austin, Texas. But he’s not driving the boxy brown vehicle to deliver packages. Mabrey is road-testing its zero-emission system—a hybrid of hydrogen fuel cells and lithium iron phosphate batteries. “It’s peppier than I would’ve imagined,” he says. Near my perch in the passenger seat, a high-pitched hum emanates from the electric motor that drives the hydraulic power-steering pump. As we approach a narrow turn, Mabrey engages the regenerative braking system, which recharges the batteries, and a whining noise erupts from the back. We’re circling the Center for Electromechanics at the University of Texas (UT), where engineers are almost finished testing the van’s power train inside a cavernous research hangar. They began road trials in June after working for more than a year to design and model the concept, though the project first won federal funding in 2013. UPS plans to deploy the prototype in California later this year and, if all goes well, roll out more vehicles just like it. Logistics companies and automakers worldwide are developing vans and trucks that don’t emit any pollution. But it’s much more complicated to build a ­zero-emission cargo truck than it is to produce an emissionless passenger car. New fuel systems can’t encroach on cargo space or add more weight to a truck’s bulky frame. And trucks must be able to run their normal routes without making extra stops to recharge batteries or refill tanks. “The driver has to be able to accomplish their mission—it’s a work truck,” says Joe Ambrosio of Unique Electric Solutions, which is integrating the UPS van’s electric components. The New York firm hired six interns from UT to work on the project, including Mabrey, who is now an engineer at the company. From the sidewalk, the van looks like any other delivery vehicle. UPS provided a 2007 diesel van to UT researchers, who converted it into a fuel-cell/battery hybrid. 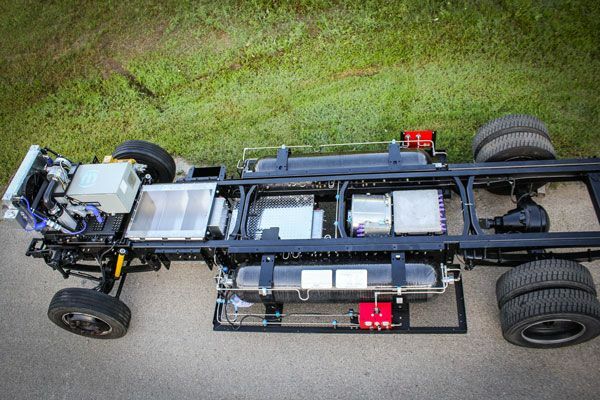 The new system includes a high-power, 99-kilowatt-hour battery pack from Lithium Werks that sits between the chassis frame rails [see right]. Two ­10-kilogram hydrogen tanks saddle the rails, while a 32-kilowatt fuel-cell module from Hydrogenics is stored below the hood, where a conventional engine would be. Engineers designed the van for a range of up to 200 kilometers, which it can achieve thanks to its “range extender”—the fuel-cell module, Ambrosio says. Using hydrogen, the vehicle can travel longer distances and make more stops than a purely battery-powered van, he says. Michael Lewis, a senior engineering scientist and the project lead at UT, says the first challenge in building the system was “right-sizing” its components. The battery pack, fuel-cell module, and hydrogen tanks needed to be big enough to support the van’s operations but still fit within its existing dimensions. The team refined its early designs based on real-world duty-cycle measurements gathered from UPS vans in California and Texas, which revealed how far the vehicles typically travel and how hilly or strenuous their routes are. UPS’s telematics technology can gather 1,700 data points per second, helping engineers troubleshoot problems and spot inefficiencies in fuel or battery use. Once the road tests are completed this year, UT will transfer the technology to Unique Electric Solutions to retrofit potentially 15 “phase two” vans, which will feature the final fuel-cell/battery system developed in Texas. UPS aims to then deploy those trucks across California. The UPS van reflects a broader push by state and federal agencies to accelerate clean energy technologies, including hydrogen. The California Energy Commission, the South Coast Air Quality Management District, and the U.S. Department of Energy are funding the project, and the nonprofit Center for Transportation and the Environment is serving as program manager. Thousands of hydrogen-powered forklifts and passenger cars, dozens of buses, and at least one other delivery van are now on U.S. roads. Hydrogen refueling stations are also beginning to pop up in California and a few other states, as well as in China, Japan, South Korea, and Germany. “There’s a real viable market beginning to blossom in certain areas of the world,” says Andy Marsh, CEO of Plug Power. Marsh’s fuel-cell company is working with FedEx and Workhorse Group to build 20 zero-emission delivery vans by next year. As of May, the first of the fuel-cell/battery vehicles had begun to haul packages at a FedEx distribution facility in New York. “This is the year that hydrogen fuel-cell vehicles began to really show some momentum,” Marsh says.